Blue Sombrero (BSB) is a provider of online registration and web design services for youth sports, with customers all across the country. However, most of BSB’s customers were more familiar with its online registration services than its web design services. As a result, BSB wanted to not only generate added customer awareness of its website design service, but also increase the number of Facebook fans and overall page engagement. c21 recommended executing a Facebook contest that coincided with National Youth Soccer Month in which a deserving youth soccer club would win a free, custom website makeover valued at $5,000. c21 launched a call for nominations that we announced via a dedicated email, directing recipients to BSB’s Facebook page where a custom webform allowed for an easy and smooth nomination process. Once the top five finalists were selected, we invited BSB’s customers and prospects to vote for their favorite via the company’s Facebook page. In keeping with Facebook’s promotion policies, all voting was conducted via a custom webform c21 created, where the only way to vote was to be a fan of the page. This increased fan numbers dramatically and generated a tremendous amount of conversation, as youth sports clubs posted about whom they wanted to win and who was most deserving. It was a tight race, but over the two-week voting period, the contest captured more than 3,000 votes, with the winning club earning 1,140 votes. (It was a nail biter to the very end). 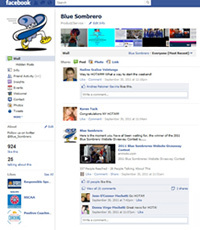 BSB gained close to 700 new Facebook fans, an increase of 847 percent. If that wasn’t enough, this increase in fans allowed BSB to surpass its largest competitor. BSB’s Facebook fans engaged with the page almost 500 times throughout the promotion, which was a 332 percent increase over BSB’s average month.